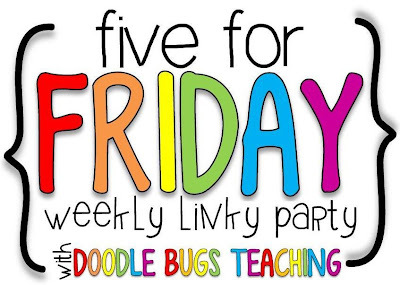 I'm linking up with Doodle Bug's Five for Friday Weekly Linky Party to share some of my highlights of the week. I wanted to share my Good Stuff Balls with you! 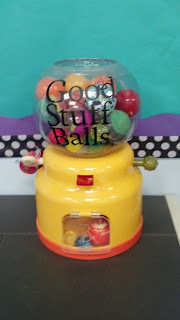 This is just a baby toy I found at TJ Maxx and I filled it with all kinds of different kinds and shapes of bouncy balls. I will use it as a random reinforcer in my classroom to motivate at times when motivation may seem null and void! I know the students will be so excited to see which ball comes bouncing out when they get to turn the knob! *Side note: My newest fascination with borders is layering (see background of picture). The purple is just strips of construction paper I cut and traced a store bought border and then the polka dotted black and white is party streamers! I used this all around my room and I still have some left! That's a cheap border that looks great! I am really excited to start the year off with an author study of Mo Wilems. My end of year kinders LOVED anything that he wrote, so I got the entire set of the Elephant and Piggie books (and the cute stuffies you can see) so they can start the year out with some of his books they hadn't seen. They are really fun books! My own 6 year old and I read most of them in a matter of a couple of days because he enjoyed them so much. Thanks to the blog Fifth in the Middle, I found this idea on Pinterest! This is ingenious...well, for people of my kind anyway! I have always used popsicle sticks to pick names out of a cup and once they've had a turn, I put it in another cup. 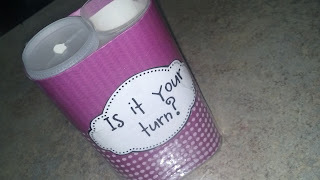 The problem is that I sometimes mix up which cup is which and so some kids get 2 turns and others get none (that doesn't fly very well in a primary classroom, you all know!). This will solve my problem: one side is open and will have all of the childrens' sticks who haven't had a turn. Once they have a turn, you simply put the stick in the hole of the other Crystal Light container and there is no mixing up with this one! Once all of the sticks are in the covered side, simply move the cover to the open side! Voila! This seriously took me 10 minutes to put together. I used clear mailing tape to tape the 2 containers together and then wrapped it around the scrapbook paper covering as well just to give it more durability. Make sure you don't tape to the tops of the containers because you will need to be able to put the cover on and off easily. I did tape across the bottom so that the cover wouldn't be able to slip off. I don't know if any of you have been to Maine (heard of Maine??? ), but we are way up there, as in the farthest North East you can go in the states. Bangor is one of the larger "cities" in the state and we have just in the past 2 years been getting some big concerts here during the summer on our waterfront thanks to a local, young entrepreneur which has been huge for our area. 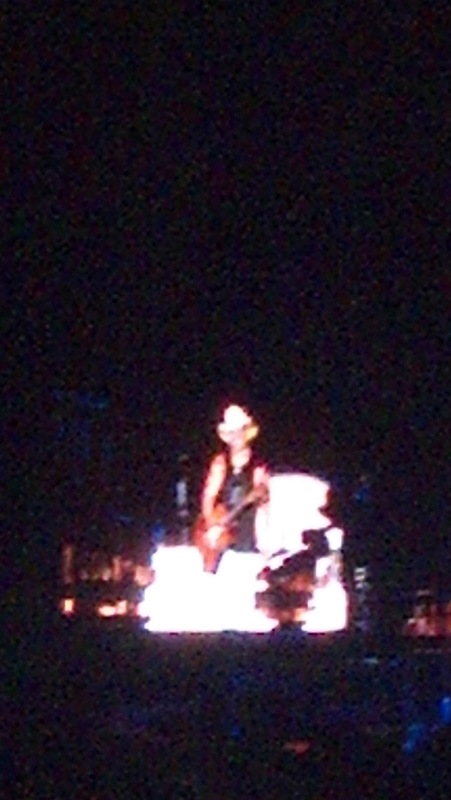 This week, as part of my week long celebration of turning 37, I got to go see Kenney Chesney on the waterfront! He is an amazing performer and entertainer and it was right down the road from my house in Bangor, Maine! Love it! 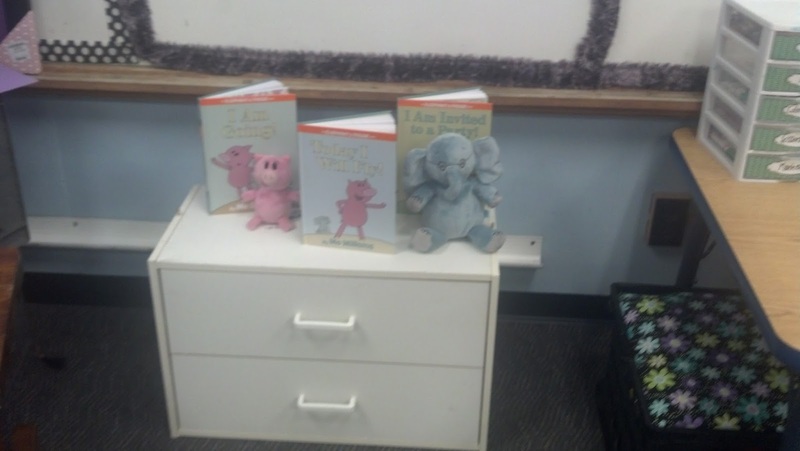 This is just a sneak peek into my classroom...it is no where near to being done, so I am only giving a little bit! As you can see, my main colors are purple and black with a splash of blues and greens. I was bright colored polka dots last year, so I've had to put a lot of work in changing over colors this summer (painting, duct taping, recovering, etc...). My favorite part is my new valance curtains...I bet you can't even tell, but they are made out of tissue paper!!!! I made curtains for my whole classroom for under $5 (because we all know just how important matching curtains are to the educational process, right??). I made them as though the tissue paper was the fabric and "sewed" with clear mailing tape and added a purple ribbon and duct tape to others! It was soooo easy and quick, too. I made them all (and hung them!) in about a half hour. No joke! Imagine the possibilities with all of the pretty tissue paper and duct tape you can find out there! 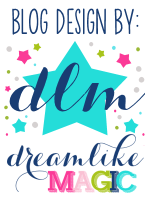 Last, but not least, I wanted to share my latest freebie with you. 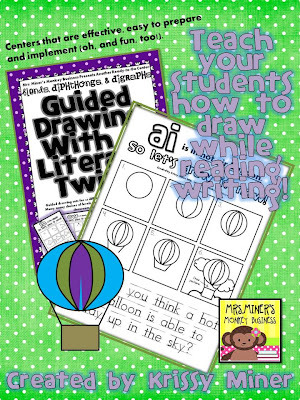 It is a Guided Drawing With a Literacy Twist sample that I hope your students will enjoy as much as mine. Since I am moving to first grade with my kinders from last year, I knew I needed to continue this center, but move it beyond the ABCs and include some blends, digraphs and (my favorite!) diphthongs! These centers are sooo versatile...you choose how you want them to be used in your room: students can read and copy one of the 2 levels of sentences provided for reading and handwriting practice, practice restating the question by answering the H.O.T. question that references the picture they've drawn OR just have them make up their own story to go along with their picture! Click on the picture below to read more about this activity and grab your freebie to try it! Your tissue paper curtain idea is genious!!! I can't wait to see more of your room. Love love love it all!! And especially the curtains...but being as uncrafty as I am, do you have a place you give directions? I'm afraid mine will just look like tissue paper hanging. I was just in Maine this summer! It is one if my favorite places to visit - we actually go every couple of years. We have lots of family there and have a family island in the waters off of stonnington. I love the new colors of your classroom - purple is still one of my favorite colors. 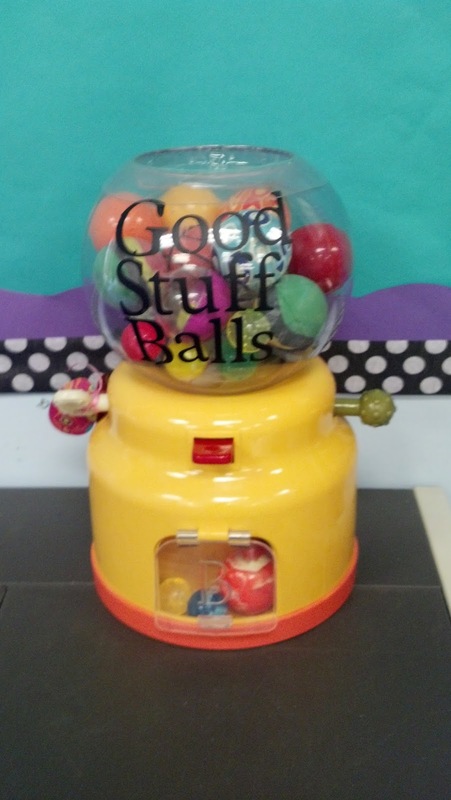 Love the Good Stuff Balls...such a cute idea! Your classroom looks amazing! Great job.